* Annual estimated passenger usage based on sales of tickets in stated financial year(s) which end or originate at Cathays from Office of Rail and Road statistics. Methodology may vary year on year. Cathays railway station is a station on the Merthyr Tydfil and Rhondda lines in the Cathays district of Cardiff, Wales. It is 1 1⁄4 miles (2 km) north of Cardiff Central. The station is next to Cardiff University Students' Union and across the road from many Cardiff University buildings, as well as a short walk from the Welsh Government and other Civic buildings in Cathays Park. The footbridge over the railway is much used as a shortcut between Park Place and Senghenydd Road. When Cathays opened in 1983 it reversed a trend to close stations. It was opened by British Rail and South Glamorgan County Council. 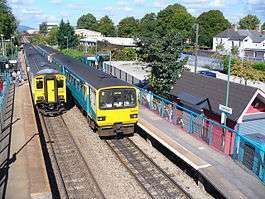 Cathays station is now manned in peak hours, since the introduction of a new automated ticket barrier system in summer 2007. Cathays has two platforms, each with a small shelter and an information screen displaying the next train's arrival. There is a car park on the Senghennydd Road side, which is University owned and not for general public use. In the daytime from Monday to Saturday, there are usually six trains an hour from Cardiff Central to Pontypridd and then either Aberdare, Treherbert or Merthyr Tydfil (every half hour to each of the latter three). Some eastbound trains continue beyond Cardiff to Barry Island (3 per hour) or Bridgend via the Vale of Glamorgan Line (hourly). There are bus services from outside the station, including the northbound Capital City Green service. Wikimedia Commons has media related to Cathays railway station. ↑ "Cathays open". Rail Enthusiast. EMAP National Publications. November 1983. p. 18. ISSN 0262-561X. OCLC 49957965. ↑ Hooper, Alan; Punter, John (2007). Capital Cardiff 1975–2020: Regeneration, Competitiveness and the Urban Environment. Cardiff: University of Wales Press. p. 198. ISBN 9780708320631.